‘TRIVIAL PURSUIT Master Edition (Play the Popular Trivia Game on Kindle)‘ by Electronic Arts Inc is available on the Amazon Kindle site for $4.99! Just click here to download! 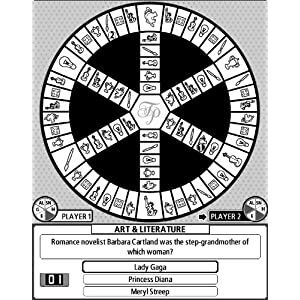 Play the popular trivia game TRIVIAL PURSUIT on Kindle! In this game, you move your marker around a circular board answering trivia questions and collecting wedges in six categories: Science & Nature, History, Sports & Leisure, Entertainment, Geography, and Art & Literature. To win, you will have to answer questions correctly from the required categories and collect one wedge for each category. Experience traditional TRIVIAL PURSUIT game play in the classic mode described above, or enjoy the faster paced Pursuit mode in which the board is not circular, but has a start and an end. The winner is the player who can reach the end first by answering the most questions as quickly as possible. TRIVIAL PURSUIT Master Edition on Kindle features more than 1,500 new questions that will challenge even the savviest player. You don’t have to keep the fun to yourself either. While you can play on your own, the Pass ‘n’ Play feature lets you can challenge a friend so you can play together. Designed for casual and experienced players alike, TRIVIAL PURSUIT Master is easy to pick up and play whenever you’d like. How fast will you earn your wedges? NOOK Daily Find! Stan Lee and the Rise and Fall of the American Comic Book by Jordan Raphael for $2.00! NOOK Daily Find! A History of the World in 6 Glasses by Tom Standage for $3.19!